Apollonius of Perga (262-190 BC), “The Great Geometer” was a younger contemporary of Archimedes. His most notable works were published in his eight books, the “Conics”. Conics are critical to understanding the geometry around us and are severely under-taught. Apollonius proposes that there are a finite number of shapes which can be created by interesting a plane in a conic. 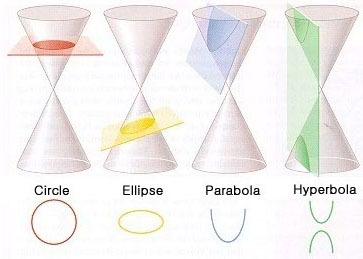 You can imagine a conic shape with a rotating plane creating forms along the way. When it is parallel with the ground it is in a pure form, the circle. From there you tilt it slightly more to form an ellipse. The ellipse is the same as a circle, but with a center that is “off”. There must then be two points, like a line, whose eccentricity is equal to the magnitude of the tilt. If you continue to rotate the plane more you will arrive at a Parabola. It seems like the parabola almost has a gradient to it when you look at the geometry. I am symbolically reminded of a gravitational field with a gradient. This connects parabolas to gravity and the symmetry of it. Lastly, there is the hyperbola which is perpendicular to two cones touching at the tip. Since the planes are intersecting at 90 degrees, it is a transfer from another dimension. The forms made reflect oppositely and are anti-pairs. They are hyperbolic space; mirror space. I would like to consider the universality of geometry and its practical application in the real world. How can we go from pure math to empirical phenomena? We take the geometry seriously. We can arrive at geometry through means of a thought experiment. Lets say I am standing in the middle of an enclosed room. We will explore the room, or volume, in different shapes and explore how symmetry transpires physically. In the first, the circle, we remain in the center and make a sound. Waves emanate symmetrically and hit the walls at the same time. Our energy transfer was symmetric and everyone who would have been on the border of the volume (and inside of course) would have heard you at the same instant. But now let’s take the ellipse for example. You can imagine an ellipse as a circle with it’s center not being points of symmetry, but the dissociation of the center into two points, focuses, which are eccentrically far apart from the center. They come from the same source so they are entangled. Since both points have the same source they are entangled and therefore allow for communication. A circle in perspective is an ellipse. You can imagine tilting the circle until it seems like the most distant side is smaller than the closest radii. So if we were to be in a room, standing on one of the foci, with ellipsoid ceilings, the focus of the sound would be found at the other foci. If person A stood on one point and another person stood on B, their conversations would be easier to hear given the acoustics of the room. Geometry can describe anything.